For students and scholars in Classics, for example, the ability to search for articles that quote or refer to a specific text passage (or range of passages) is of essential importance. An index of cited passages, which is normally found at the end of monographs or edited volumens, serves precisely this purpose. Yet, when it comes to searching through archives of journal articles like JSTOR, full text search is often the only functionality offered. And, in many cases, it’s not sufficient, or not the most effective way of retrieving bibliographic information. 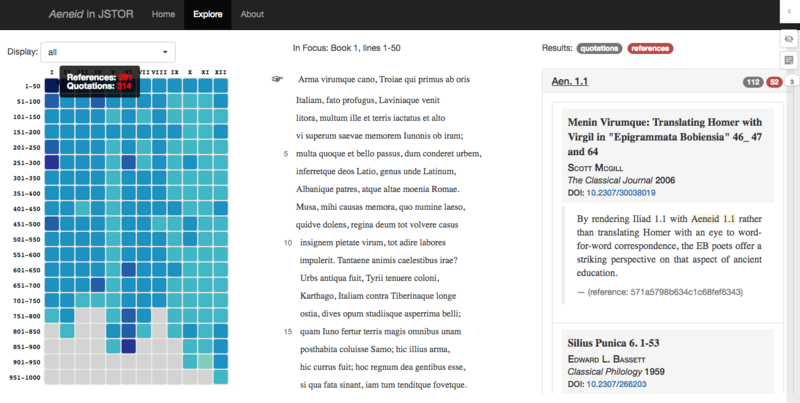 Cited Loci of the Aeneid is a proof-of-concept aimed at showing how technologies that are being developed rather independently in the field of Digital Humanities, if combined together, can enable whole new ways of searching through large electronic archives. It’s more a hack than it is a real project, and it is the result of an online conversation that went on for almost a year. This conversation brought together various research groups working on different yet intertwined topics: Neil Coffee, Chris Forstall, Caitlin Diddams and James Gawley who had been investigating in the Tesserae project the automatic detection of intertextual parallels within classical texts; Ron Snyder from JSTOR Labs who had been working on extraction of quotations of primary texts (e.g. Dante’ Commedia, Virgil’s Aeneid, etc.) and Matteo Romanello who had developed a system to capture canonical references to classical texts from the full text of journal articles. This content was selected for Digital Humanities Now by Editor-in-Chief Caitlin Hartnett based on nominations by Editors-at-Large: Greta Swain, Jajwalya Karajgikar, LaQuanda Walters Cooper, Rebecca Kahn, Emily Esten.